Eleven years ago owner Mark Stolle opened the doors of his shop Manchester by the Book. Although the name was not his favorite, the store has since become a staple in the community where residents view it as a place to rest, relax, enjoy a book—or two—and an interesting conversation. Like most small businesses on the North Shore, Manchester by the Book in the center of Manchester by the Sea, MA, started small an idea and some books from Stolle’s parent’s basement. “I saved everything I made to buy books,” Stolle said. “I went to estates sales, garage sales, used book stores, library sales, you name it.” After three years he had enough to open. Now the shop holds over 15,000 books from antique to shiny and new, piled to the ceiling and on shelves that create a maze-like effect. 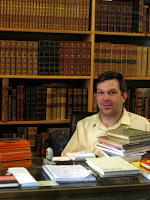 At his desk, Stolle’s head bobs up and down in the sea of hard and paperback companions. Giraffes are painted on the wall of the children’s section, a generous gift painted on the day he opened by a teacher and her husband whose names Stolle now can’t remember. The books, their prices and their subjects are as diverse as the homes they came from. Prices range from $0.00 to the thousands. “The books we have for free are hidden around and its just like a treat if you find it,” said employee Jade Weston, a frequent customer at the store before Stolle hired her to help. The ambiance and reputation in Manchester by the Book are the primary reasons why, despite the economy, Stolle’s business continues to thrive. The store hosts a number of community events as well as a book club, dessert nights, author readings and a poetry contest for valentines. “Our efforts aim at making a cultural community center, sort of your living room away from home,” said Weston. Even with technological changes like electronic books such as the Kindle or Nook, the shop has seen steady business. “Kindle is nothing,” said Stolle.“Kindle was made for the non-reader who will read what, like three best sellers in a year?” According to Stolle, such devices can’t replace the overall ‘magic’ that happens when reading a book and holding it in your hand. “(Everything from) the aesthetics, the cover, the feel of the pages, the typeface, being able to put a book down and pick it up five minutes later, are all a part of the reading experience,” said Stolle, who believes the novelty of electronic books will wear off and they too will find their place on the shelf. I am always into learning more in this domain. Thanks for your lovely tips. I will return soon. Your efforts aim at making a cultural community center sort of your living room away from home you saying believes the of electronic books will wear off and they too will find their place on the your shelf. even with technological changes like electronic books such as the Kindle or Nook, the shop has seen steady business. I like reading your story, thank you for posting it. It's really inspiring me, thank you so much. Thanks for Sharing useful Information..!!! Eleven years is quite a long time ago, and seeing that the business 'manchester' is still on the track is quite a commendable thing. errors editing help This is a captivating post, and for sure i would like to see more of such information. That was an excellent review of the book and the article has addressed important survival tactics of the small business. I am sure that the small business owners have been empowered and the will apply the shared principles. Additionally, if you need more business articles you can feel free to hire our writers by clicking on Stata Experts for Hire. I like the outlook of the site and the content it carries according to the massage of the writer. It is worth to appreciate what you have before you get your business growing. Might be a small business but we can help you know the best tactics to make bigger. The main reason for offering quality writing services to our clients is to ensure they succeed. Feel free to reach us for custom article review writing service and we will gladly help. What people do look for in pages is relevant information, and that's what i found on this post. Its a page that when i look at it, i see the kind of information that is professional and unique. Meanwhile, when people seek relevant information, they also look for where to find the best cover letter editing services. If you are in need of such services. We are a call away. I plan to introduce. If you have any kind of questions regarding where and ways to utilize FreeChip, you can contact us at our own web site. It is never easy to find this kind of a post, since this is a page that is very informative and relevant. I am very impressed with what I have found on this page. I would very much like to see more. When you feel that you want to hire freelance Kenyan writers, we are the best choice. We do have the best freelancers for hire, experts that have the most professional writing skills. Check for Railway Group D Admit Card. this really helps me in all aspects of life so please keep making this article more to help others again.